Lady Annalyse Granville is the cursed second twin, and has been hidden away in a nunnery most her life. Now she’s been called back to her family’s castle by her very pregnant sister who is also the mistress to the king. As she loiters under the kissing bough, she receives her first kiss from the ruggedly handsome Scot, Ross Douglas. Little does she know that it is only the beginning of a destiny that she would never have imagined even in her wildest dreams! Lady Annalyse Granville was sure to go straight to hell. Clad in her plain, rough-hewn brown gown with her head covered by a white wimple, she clutched her long woolen cloak around her body, shivering from the winter cold. Purposely pausing in the entranceway of her father’s great hall, she’d stopped directly under the holy bough – or what was known to many as the kissing bough. Having been raised in the abbey although she wasn’t a nun, Annalyse shared the morals and customs of the women of the cloth but hated every minute of it. However, even with her sheltered life she was wise to the legends of the kissing bough and knew that any lady standing under it from Christmastide all the way to Twelfth Night would receive a kiss, or perhaps several, from any knight or passing lord. Most noblewomen her age were already married or at least betrothed. Annalyse was twenty years of age and, sadly, had never even experienced a kiss from a man. This was because of her curse of being born the second twin – a position that tagged her as a spawn of the devil. The consequences of her birth made her feared and undesirable to everyone. Of course, it was naught but an addlepated superstition, but her father believed it. That is why she’d been sent to live with the nuns. No one wanted their life cursed by an evil second-born twin bringing them bad luck. Matter of fact, no one wanted a second-born twin at all. She hated superstition since it ruined her life. If it hadn’t been for her ill luck, she’d be here celebrating Christmas with the rest of her family, as was her right for being born a noble. But instead of being treated with respect and honor for being the noblewoman she truly was, others acted as if she had the plague and went out of their way to avoid her. If the nuns had known of her whereabouts tonight, they would tell her she had no right to be in a hall full of knights that were all well in their cups on this cold winter’s eve. Annalyse shook her head. It no longer mattered because she didn’t care. Her presence here tonight was for a reason. Her twin sister, Gabrielle, had sent her a missive and it had sounded so urgent that she’d daringly sneaked out of the abbey and traveled unescorted to the borderlands during the night so she wouldn’t let her sister down. Her actions tonight had been dangerous, reckless, and bold, and it hadn’t stopped with her journey here. Looking up to the kissing bough hanging right above her head, her heartbeat resounded in her ears so loudly she was sure others could hear it, too. Never had she thought she’d ever be standing under a kissing bough and the idea excited her. The bough was a ball interwoven with twigs and fir tree greenery, decorated with an apple, candles, and berries. The abundance of holly decorating it would surely bring good luck. Then she saw the ivy above her head and a knot formed in her stomach. Everyone knew ivy was supposed to be kept outdoors and not brought across the threshold because that meant death. Then again, perhaps that was naught more than a silly superstition. Dangling precariously from the bottom of the kissing bough was a fresh sprig of green mistletoe with several small, white berries. This was something she’d never seen at the abbey. The church didn’t allow mistletoe within its holy walls since it was associated with pagan customs and Druids. Once again, Annalyse felt as if she were doing something naughty by standing here. Not just because of the traditions, but because her sister needed her and she was purposely stalling. Gabrielle, being the first-born twin, had experienced kisses under the mistletoe many times in her life and Annalyse decided now it was her turn. She couldn’t pass up this opportunity. Even though Gabrielle was heavy with child and her message sounded urgent, she would have to wait just a little longer. Annalyse’s eyes dropped from the kissing bough to see a Scot with a tankard in his hand heading in her direction. His broad chest was large and foreboding, while his hair boasted the color of the fiery hot flames of hell. Not that she’d know what the flames of hell looked like, since she’d been raised by nuns and attended church several times a day. If the nuns hadn’t been superstitious, they would have accepted her into the Order. But they didn’t want The Almighty scowling down at them for bringing a cursed second-born twin into their Order and so she remained an outcast even in the eyes of God. The Scot’s craggy brows lifted and she saw a playful twinkle in his dangerous green eyes. Scots were to be feared and this one looked to be an abundance of trouble. He smiled at her. That told her he didn’t know who she was or he’d be keeping his distance. With a saffron leine half-open she could see the hairs on his chest peeking out from between the leather laces of his tunic. A dark green plaid wrapped around his waist and was thrown over one shoulder and pinned with a metal badge. She didn’t dare even to breathe. Never had she ever been so close to one of these savages before and wondered if she were in danger. After all, the Scots were enemies of the English. What could this man possibly be doing in her father’s castle? Her gaze shot around the room as she desperately scanned the area, looking for her sister. 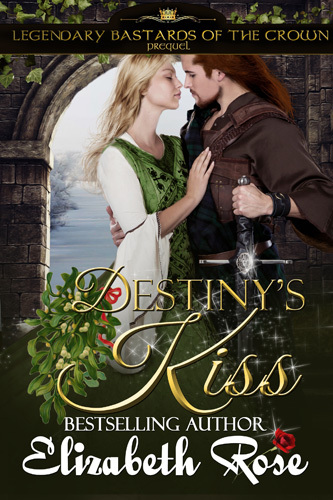 Gabrielle was nowhere to be seen, only ladies and knights standing under more kissing boughs. The women giggled and the men pulled them into their arms and kissed them in front of everyone. This wasn’t what she expected to find at all and it would do naught to help her out of this awkward position. Before she had a chance to object, the Scotsman pulled her up against his chest with one hand while he cradled his drink in the other. “I – I think you –” She never had a chance to finish her sentence because his mouth covered hers with a big, wet kiss.